Stadio Renato Dall’Ara formerly known as Stadio Littoriale is a multi-purpose sporting arena used primarily by Bologna F.C for football matches. English fans may recall the stadium hosting the 1990 world cup match between Belgium and England where David Platt scored in the 119th minute in extra time to send the team through to the quarter finals. 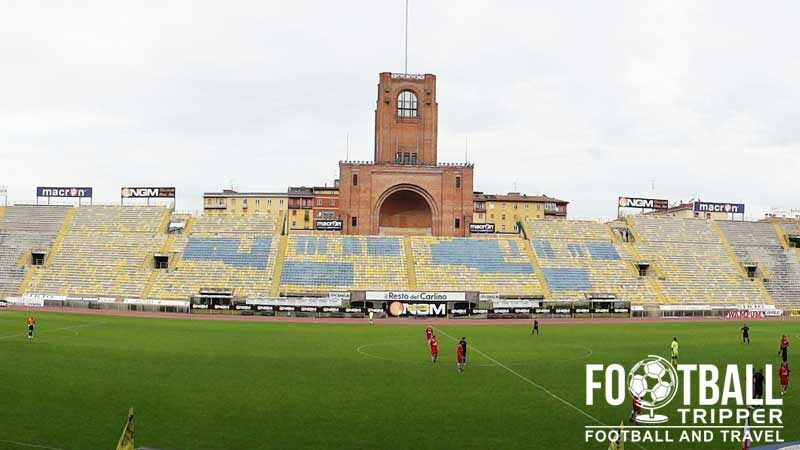 Stadio Renato Dall’Ara first opened in 1927 under the name of Stadio Littoriale, and was designed by Leandro Arpinati who would later become the Mayor of Bologna. During the era of Italian Fascism variations of the stadiums name which paid tribute to the political party’s youth wing were popular, and were given to other stadiums such as ones in Palermo and Varese. Visited by Benito Mussolini himself in October 1926, and later on inaugurated on 29th May 1927 by the King of Italy who attended the first ever match between Italy and Spain, Littoriale Stadium initially had a capacity of 50,100. As one of the country’s largest and most modern stadiums at the time it was chosen to host two matches of the 1934 World Cup. After World War 2, Italian stadiums named during the fascist era were changed to politically neutral, and Renato Dall’Ara became Stadio Comunale in 1945. In 1983 it was renamed in to Stadio Renato Dall’Ara in honour of Bologna’s much loved president who served the club for over 30 years between 1934 and 1964. He presided over the club’s most successful period which brought home five Serie A titles. 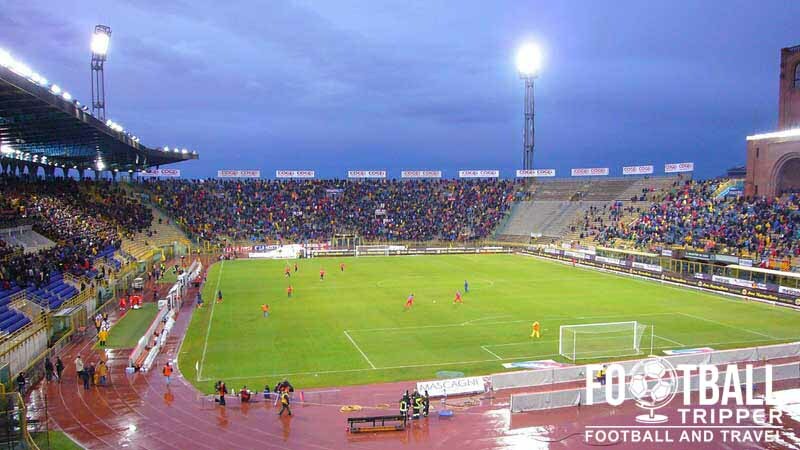 Selected as one of twelve venues for the 1990 World Cup, Stadio Renato Dall’Ara underwent significant renovation work in order to modernise the facilities including a new roof over the grandstand, better floodlights and refurbishment of the exterior façade. In total it hosted four matches including three matches of Group D and a round of 16 between England and Belgium. Now used predominantly to host home matches of Bologna F.C, the ground occasionally hosts rugby matches such as three international test matches in 1995. 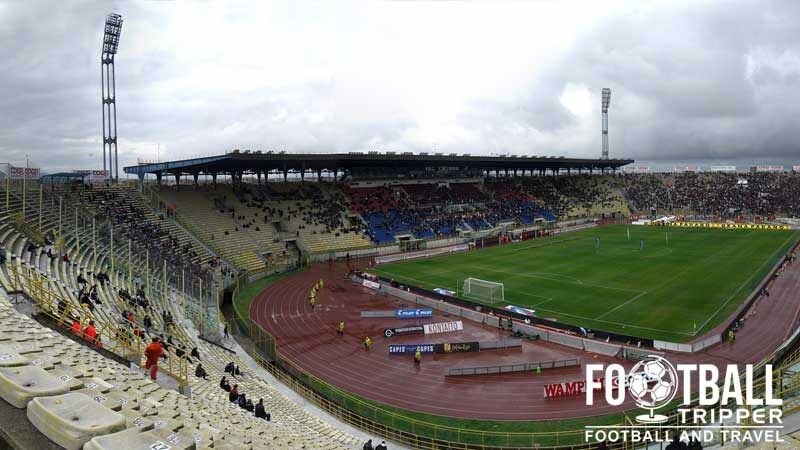 Despite rumours of the club attempting to build a new stadium, nothing has yet to come to fruition which means Bologna are likely to remain at Renato Dall’Ara for the foreseeable future. 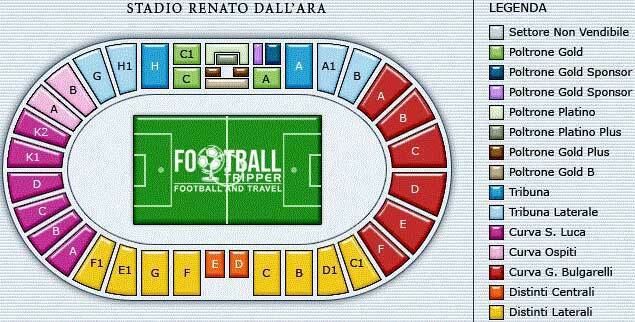 Stadio Renato Dall’Ara is comprised of four stands: North, East, South and West. Away fans are housed within “Curva Ospiti” which is located within the south-west corner of the stadium. The area spans two sections of seating marked in the above seating map as A and B next to the newer main stand. Compared to a lot of Italian stadiums, Stadio Renato actually has quite a few options when it comes to pre-match food and drinks with numerous restaurants boxing the ground in. Towards the Northern Stand along Via Andrea Costa there are three Pizzerias which are popular with fans: Ristorante Pizzeria La Languouste, San Gennaro Pizzeria and Pizzeria Ciclope. Towards the Curva Sud there are options along Via Porrettana with Trattoria Meloncello and Bar Pasticceria Minny being the two stand out choices. As you’re probably aware Bologna is the birthplace of Spaghetti Bolognese and the historic city has a proud culinary tradition, so it’s definitely worth making the effort to dine out somewhere nice if you’re making the visit. Bologna’s official club shop is located at Via Andrea Costa 204 which is very close to the stadium – essentially on the main road behind the Curva Nord. It sells an abundance of Rossoblù merchandise. Sundays: Open when Bologna play at home. There are no tours available for Stadio Renato Dall’Ara which is unsurprising due to the lack of commercial suitability of the stadium. As we say with most Serie A clubs, if you get there early enough you can walk around the stadium and get a decent feel for what it’s like. 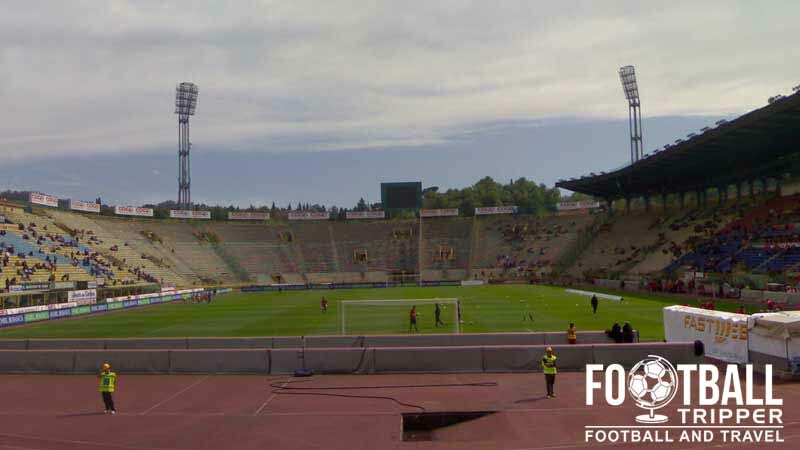 Tickets for Bologna matches can be purchased online and at the usual places including a the stadium in the days leading up to the match and around the city from local businesses. They are likely to cost anywhere between €18.00 and €90.00 for the smaller clubs such as Sassuolo or Catania and anywhere between €25.00 and €110.00 for the larger, higher profile clubs such as Juventus, Inter and Milan. The Stadio is located less than 2.5 miles west of Bologna’s concentric circled city centre which makes it really easy to access using the standard range of transport options. Bologna flags proudly been waved throughout the stadium before kick-off. Bologna Centrale railway station is sandwiched between Milan and Florence’s high speed lines which gives the city great accessibility from around the peninsula. When it comes to getting to the Stadium, there isn’t a smaller satellite station to get off at meaning that you can either make the walk which would take 40-45 minutes or get the bus. From the station the number 21 bus does the trick, taking 18-20 minutes and departing 3-4 times an hour during peak times. If you’re coming from the city centre then you can still catch the 21 at the Via Marconi or simply get the Bus number 14 which departs from Via Rizzoli and will take you a slightly shorter 15 minutes. The closest airport to the city is Guglielmo Marconi (Bologna) International which is 3.5 miles North of stadium and about 4 miles or so from the city centre. Once you have arrived you can either get a shuttle known as the Aerobus BLQ service to the city/station or pay for a taxi which shouldn’t cost more than €20. Both journeys will take about 20 minutes. Eventually the plan is to create a Marconi Express which is a monorail line which will link the airport to the Central railway station, but there’s no official word on the completion date. There is a real lack of hotels close to Dall’Ara but the city centre more than makes up for this with a superb range of choices such as The Alloro Suite Hotel (Budget), Hotel Centrale (Mid-range) and Millennhotel (Closest to station).